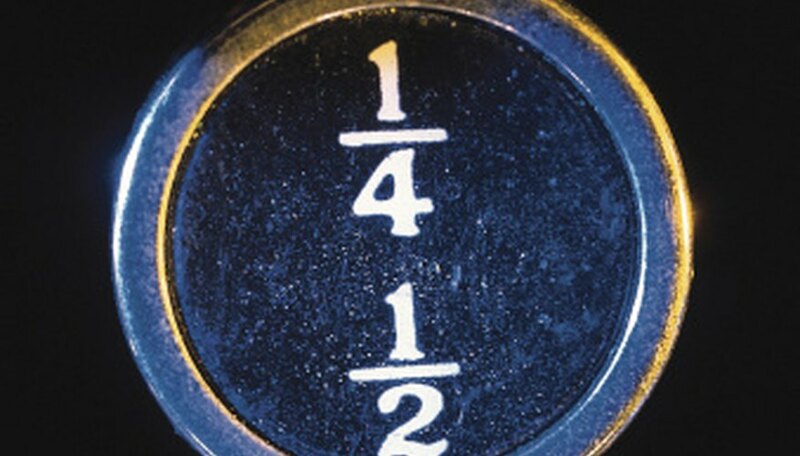 Fractions cause anxiety for many students regardless of age or math level. It's understandable; forget just one of the many steps -- even if it's the simplest -- and you get a missed point for the entire problem. Following step by step instructions for fractions will help you to get a handle on the many rules to combine fractions with math properties and will illustrate how those rules influence fractions. Examine the expression 3/6 + 1/8. These fractions identify two different groups, sixths and eighths and cannot be added or subtracted. They must have a common denominator; that is, be of the same group. Write the multiples of 6. Multiples are numbers that six times another number equals, for example, 2 x 6 = 12. More multiples of 6 include 18, 24, 30 and 36. Write the multiples of 8: they include 16, 24, 32, 40 and 48. Look for the lowest number that 6 and 8 have in common. It's 24. Multiply the numerator and denominator of the first fraction by 4 because you multiplied 6 times 4 to get 24: 3/6 = 12/24. Multiply the numerator and denominator of the second fraction by 3, again because 8 x 3 = 24: 1/8 = 3/24. Rewrite the expression with the new denominators: 12/24 + 3/24. Now that the denominators are the same, you can proceed with the addition process. Examine the problem 3/4 + 2/4. Because the denominators are the same, you can add the fractions. Add the numerators: 3 + 2 = 5. Write the sum of the numerators over the original denominator: 5/4. This is an improper fraction. Leave the answer as is or turn it into a mixed number by dividing the numerator by the denominator. Write the quotient as the whole number and the remainder as the numerator over the original denominator: 5 ÷ 4 = 1 and 1/4. Examine the problem 5/8 – 3/8. Again the denominators are the same. Subtract the numerators: 5 – 3 = 2. Write the difference over the original denominator: 2/8. Because both the numerator and denominator are multiples of 2, reduce the fraction to its simplest form. Divide both parts of the fraction by 2: 2 ÷ 2 = 1 and 8 ÷ 2 = 4. Therefore, 2/8 reduces to 1/4. Examine the problem 5/7 x 3/4. The denominators do not have to be the same for multiplication and division. Multiply the numerators, 5 x 3, and the denominators, 7 x 4. Write the products as a new fraction in the solution: 5/7 x 3/4 = 15/28. Examine the problem 4/5 ÷ 2/3. 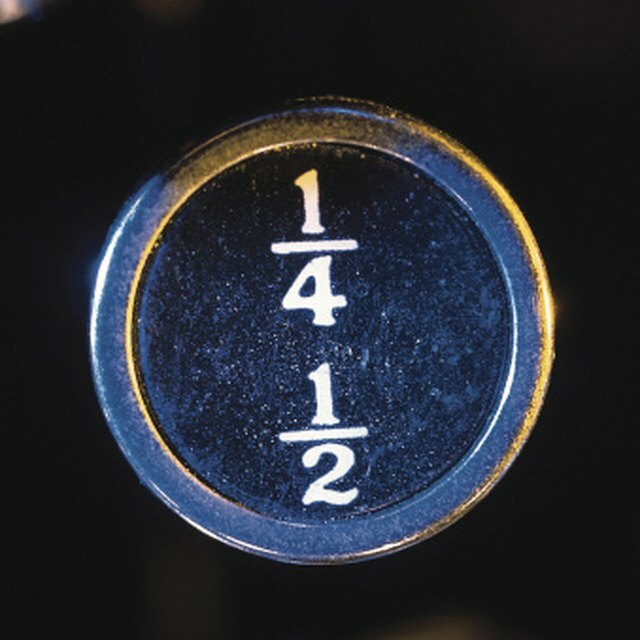 This is called a complex fraction, which needs to be simplified in hopes of reducing the denominator of the second fraction to the number one. Flip the second fraction and change the property to multiplication: 4/5 x 3/2. Multiply straight across the fractions: 4/5 x 3/2 = 12/10. Reduce the answer by dividing both parts by 2: 6/5. Alternatively, you can do the following: Notice that the numerator of the first fraction and the denominator of the second fraction are both multiples of 2. Cross out the numerator, divide it by 2 and write the remainder in its place: 2/5. Then cross out the denominator, divide it by 2 and write the remainder in its place: 3/1. This is called in-problem reducing. It simplifies the denominator of the second fraction to 1, and eliminates the need to reduce later. Fuller, Tuesday. "Step by Step Instructions on Math Fractions." Sciencing, https://sciencing.com/step-step-instructions-math-fractions-8507549.html. 25 April 2017.